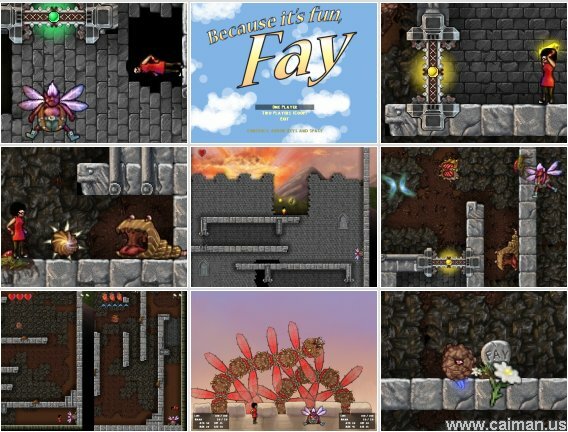 Caiman free games: Because it's Fun, Fay by Oxeye Game Studio. In the first part of the level you have to play with two characters: Jay and her flying friend Cornipolous who can destroy the enemies. Jay can't but she is able to pick up the colored keys and open doors with it. Don't forget to pick up all powerups, you will need them for the end. 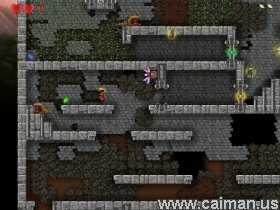 At the end of the level you have to beat a big boss. A shame the graphics of the big boss are very poor and I didn't like the way you have to beat the boss. (It's like you play a fight made with RPGmaker). But good, cause the end-game sequence is pure awesomeness, this game is still worth a download. Go on everyone! 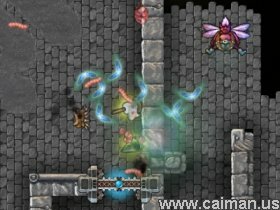 Finish the game and be amazed!